Very few of us are born with a perfect smile. But with advances in modern dentistry there are many options to improve your smile, from the shape and orientation of your teeth, to their whiteness and brightness. Porcelain veneers can dramatically improve how your teeth look, feel and function. They are indistinguishable from natural teeth and provide an ideal solution for worn, shortened, discoloured or crooked teeth. 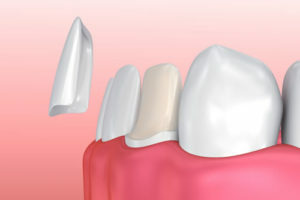 Veneers are a thin layer of either ceramic or porcelain which covers the surface of the tooth. Dental veneers can transform a smile, by masking out imperfections and creating a harmonious even smile. They are custom made to fit each tooth perfectly. You can improve the shape, size and angulation of your teeth. They can close gaps and make crooked teeth straight. The thin porcelain shell is stronger than a direct composite veneer and less susceptible to staining. They require more planning, and are more expensive than composite veneers and are not suitable for all patients. They are an excellent option to give people back a natural smile, or even a brighter smile in the right situation. Are hand sculpted by the dentist onto the surface of the existing tooth. They offer a natural appearance are very conservative and often don’t even require any tooth preparation. Composite veneers are made of resin (plastic), consequently they can lose their lustre over time and can also stain more easily than porcelain veneers. However, they can also easily be repaired at little expense. Composite Veneers are an excellent way to rebuild teeth quickly, beautifully and economically.